If you want to compose a text at runtime, you need to code each character, saving them in the program memory. Program’s source code (C#) is available in a GitHub’s repository; you can also download a compiled version here. 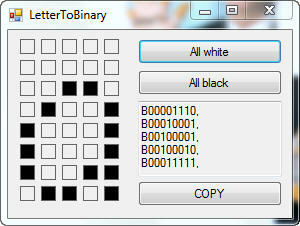 From this array Arduino can learn that – for example – the $ character is 5 bytes long and starts from byte 12 of aipointe_font array. If you observe an ASCII table, you can notice I started coding the font from character ! This character has a decimal value of 33 and its informations are saved in element 0 of aipointe_info array: this means that, to know the position each character has in that array, you need to substract 33 from their decimal value.